Micron' Part Number: MT16HTF25664AY-800G1. HP Part Number: 404575-888. s (Subject to Clearance). If there are any problems, we are unable to follow up on progress because it has not been sent on our account, this will be down to you. DDR2 800 (PC2 6400). 240-Pin DDR2 SDRAM. 2GB (2 x 1GB). Manufacturer: HP. Part Num: 683804-001. QA Certified! 2x HP Proliant 499277-061 4GB PC2-6400 DDR2-800 ECC Server Memory NEW/FREE SHIP! NEW , warranted no DOA. 2x 4GB (8GB total). · DDR2 PC2-6400P. HP P/N: 499277-061 (2x 4GB). Micron P/N: MT36HTF51272PY-80EE1. Matching pair of 2x 4GB 2Rx4 PC2-6400P-555-13. Form Factor. HP Compaq Presario SR5860AN. HP Compaq Presario SR5890AN. HP Compaq Pavilion a6422.it. HP Compaq Pavilion a6422.fr. HP Compaq Pavilion a6330la. HP Compaq Pavilion a6332f. HP Compaq Pavilion a6421.ru. HP Compaq Pavilion a6421.fr. This success has been built on a number of core principles :-. OFFTEK Part Number :- FT512MSQ64V8U. Capacity :- 4GB Module. A huge database of information allows us to provide upgrades for almost any computer. Cash on Collection. Image for illustration purposes. Rest of the World. Manufacturer: HP. Up for Sale is a genuineHP 468948-561 unit. This HP 468948-561 is in excellent condition and ready to be redeployed. A representative will respond quickly. The item you will be receiving will be labeled with part number 468948-561. 1GB x24 24GB Total. HP 404574-888 PC2-6400U DDR2 SDRAM RAM Computer Desktop. Item Information. We partner with the largest computer part wholesalers throughout the United States and provide the highest quality products available. All inquires will be answered within 24 hours. We strive to be your #1 source for computer parts. Capacity :- 2GB Module. Form Factor :- 200 Pin SoDimm. This focus has allowed us to build a knowledge base that is second to none. This success has been built on a number of core principles :-. A huge database of information allows us to provide upgrades for almost any computer. 10x HP 404574-888 1GB PC2-6400 Non-ECC memory Modules - FREE SHIP! 2x 4GB (8GB total). · DDR2 PC2-6400P. HP P/N: 504465-061 (2x 4GB). Matching pair of 2x 4GB 2Rx4 PC2-6400P-555-12. DIMM 240-pin. Form Factor. 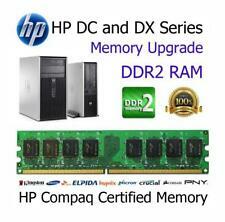 Manufacturer: HP Part Number: 404575-888 Warranty: 6 Months Shipping: Free Fed Ex ground or USPS shipping. HP Compaq Presario SR5860AN. HP Compaq Presario SR5890AN. HP Compaq Pavilion a6422.it. HP Compaq Pavilion a6422.fr. HP Compaq Pavilion a6330f. HP Compaq Pavilion a6205.fr. HP Compaq Pavilion a6421.ru. Bus SpeedPC2-6400 (DDR2 800MHz). Form FactorDDR2 DIMM 240-Pin. HP 404575-888 [EBE21UE8AFFA-8G-F]. Sides PopulatedDouble Sided. Lead-Free StatusLead Free. Heat SpreaderNo. CAS LatencyCL6. ProfileStandard Profile.